Trinity Church is located at 79 Broadway in Lower Manhattan. 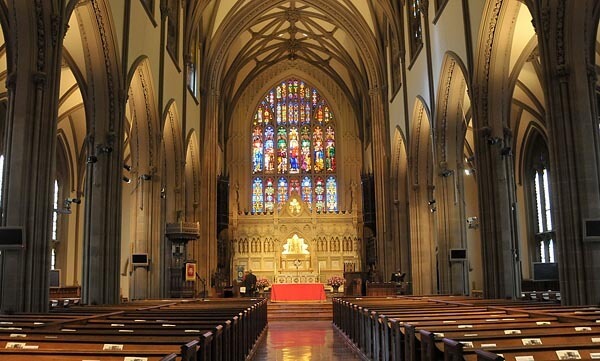 Also known as Trinity Wall Street, it’s a historic active church located at the corner of Wall Street and Broadway. On May 6, 1697, the land was purchased for contraction of the original church and it received its charter from King William III of England. Contraction of the first church building was completed in 1697 and William Versey was the first rector. Trinity School was founded by William Huggleston in 1709. It was the charity school of the church. Kings College, now Columbia University, was chartered by King Georg II in 1754. The church was destroyed during the Revolutionary War. The rebuild was completed in 1790. St. Paul’s Chapel is part of the parish of Trinity Church and is the oldest public building in continuous use in New York today. It is also still part of the parish of Trinity Church. Harsh winters of 1838-1839 weakened the structure of Trinity Church and it had to be torn down. The third and final Trinity Church was completed in 1849. With its spire and cross, it was the highest point in New York until 1890 when the New York World Building was completed. The United States Department of the Interior named the church a national historic landmark in 1976. During the 9/11 attacks, the church served as a refuge for victims. The church is associated with three burial grounds, two of which are the final resting place of many great American historical figures. Laid to rest at Trinity Churchyard are Alexander Hamilton, Robert Fulton, and Captain James Lawrence among others. Trinity Church Cemetery and Mausoleum is the only remaining active cemetery. The final cemetery is the Churchyard of St. Paul’s Chapel. Today, Trinity Church provides a full schedule of prayer and Eucharist services throughout the week and is available for special occasions. The church also provides Christian fellowship and outreach programs to the community and the city, as well as the world. It houses a museum with exhibits about the church history and changing art, religious, and cultural exhibits. Guided tours are offered daily at 2pm. Last updated by Heathr Rudebusch on 14 August, 2011 in Destinations.